Here's yet another great piece of Community fan art by Deviant Art artist kinjamin, who previously created the Community Hero and Villain Batman art that we've posted in the past. This time he took the characters deep into the brutal underworld of the classic video game Street Fighter, and it turned out awesome! All of the characters look great. Abed/Ryu - I mean really was there any question? Particularly when the show goes into genre-mode, Abed is undoubtedly the architect or the focal point. So why isn't Abed Dhalsim? Yeah, I realize Danny Pudi is actually of Indian heritage. But really, there was zero intention of breaking up the Abed/Troy bromance.. particularly if it perfectly mirrors the Ryu/Ken friendship. Additionally, ALL the characters in this piece, with the exception of Jeff, are playing the part of a character that is not their race or ethnicity. Pierce/Zangief - I found he was just the funniest thing on the page. I wish I found a clever way for him to do his gay gesture again. But alas, it never came to me. Why isn't Pierce Blanka? Him turning into a green, raging monster was dealt with in the very awesome Community/Avengers mash-up. Changka - I'm going to jump right into the inevitable questions. Why isn't Chang Fei-Long? I thought about this... but how boring would it be if I just made him shirtless and threw on some black pants. I felt it really wouldn't graze anyone's funny bones. Why isn't Chang E-Honda? Because as a Filipino-American, I get slightly annoyed at how Asians are just interchangably used for other Asian ethnicities. And the idea of making a Korean man playing a Chinese man play a Japanese man really just irritated me. And in the spirit of the show, it would mean I was as insane as the Dean. Hello? Why didn't you make him CHANGIEF!? Yeah, this might be my only regret because it sounds so dope. But really, when I drew Pierce as Zangief, I didn't want to reverse my initial decision. Besides, Changka sounds almost as cool. Annie/Chun-Li - Really, I felt Annie embodies Sakura more. Especially since Abed is Ryu. But I quickly realized depriving the internet world of dressing Alison Brie as Chun-Li would be a complete disservice. So... you're welcome. Dean-Li - Before the gag gets really old, I had to have him steal Annie's thunder this time. (Previously had him steal Shirley's Catwoman thunder. Then Britta's Poison Ivy thunder.) Why isn't Dean [Some other Street Fighter character that's a woman]? I didn't want to go past Street Fighter 2 Turbo Edition. So really, there were only two options. Jeff/Guile - I felt this was kind of a no-brainer. Jeff, like Guile, is seemingly obsessed with his hair whenever there is downtime. Jeff's pretty vain... why isn't he Vega? With the exception of Shirley, this is more of a hero piece than a villain piece. Maybe if I was a glutton for punishment, I'll do a Dark Timeline version of this. But don't hold your breath for that. Shirley/Akuma - This is actually my favorite in the whole drawing. I really really wanted to play off the 'Big Cheddar' persona that was introduced in the foosball episode. And what better character displays such an inherent evil than Akuma? Also, I had to pat myself on the back for the large beads leading into a big purse. I neglected that aspect of Shirley previously. COMMUNITY Cast Re-imagined As More BATMAN Heros! 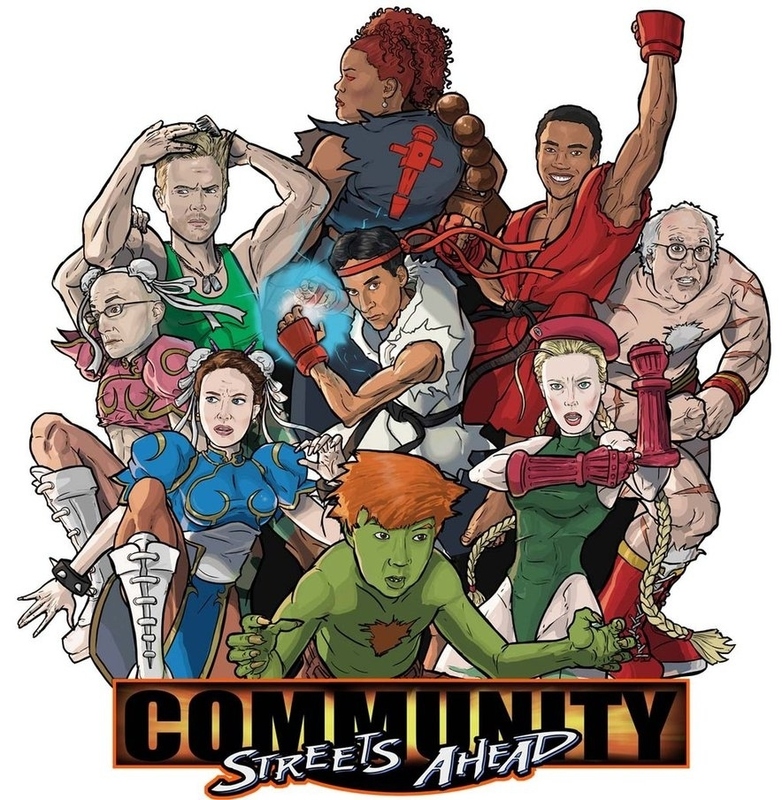 COMMUNITY Cast Reimagined as X-MEN Characters!